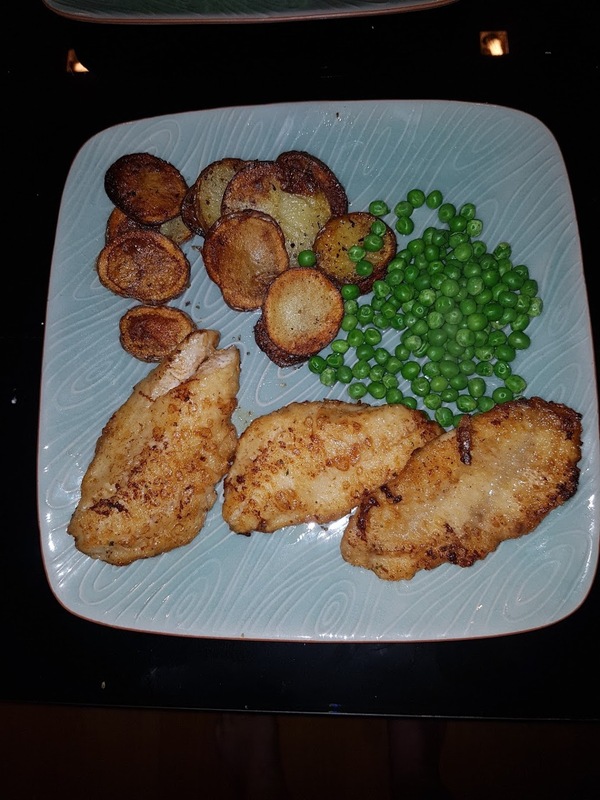 Pan fried cod, with cottage potatoes and peas. With Aioli dipping sauce on the side. Cod and sauce was from passiondelivery and very nice. Some of the cottage fries were over done but most of them were lovely I hadn't had cottage potatoes in a long time. This would be a typical shore lunch back home were I come from. Except we would be eating walleye. This is nice fish. If you're like me, and love fried chicken and a good deal, you'd visit the local fried chicken shop near my house regularly... like I do. It's a small shop owned and run by an elderly (70+) couple and one middle-aged lady helper. They are always lovely & welcoming and today was no exception. All they sell is fried chicken, yellow rice, white rice and sticky rice... take away... and they are always busy. Their batter is light and delicious; the ladies always cook everything to golden-crispy and then lay it out, along with fried peanuts. You choose what you want: breasts, thighs, wings, tenderloins, drumettes, skin or whole fried carcass @ 5-30 baht/per pc. Today, being only a little hungry, I stopped by, was regaled with big smiles & greetings of Hello, Michael! 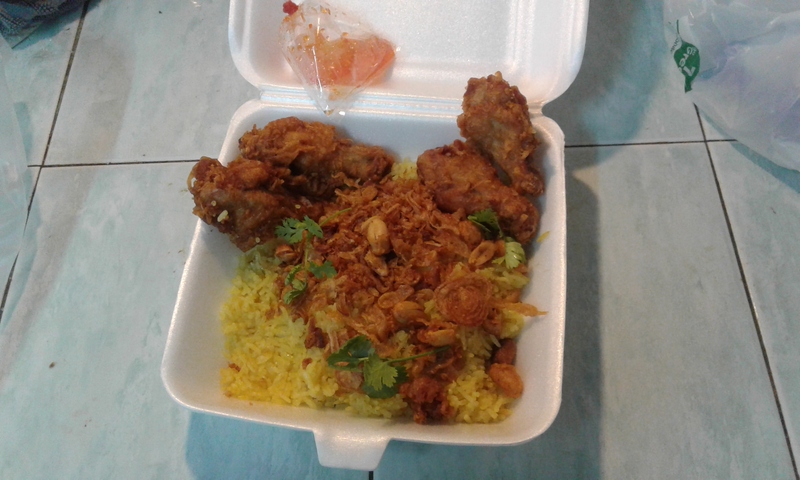 and chose a foam box of yellow rice with fried shallots accompanied by four drumettes, fried peanuts & sauce... 30 baht. Sheesh, what a deal... and dee-licious! What is that? Looks very nice! Okay this is not really traditional but I have left over goulash and and a lamb pasty. The pasty is from Passiondelivery and we made the goulash at home. If you do not have this sort of goulash you can order it through Foodpanda and have it delivered through Bei Otto. That German man has been in Bangkok for a few decades and in some cases is hard to beat. I dare anybody to find a better pea soup. None the less this is home made goulash and a lamb pasty that gets dipped into it. We ran out of bread so this is what I am going to do as a compromise. The pastry is beautiful on these things anyway. All it needs is a gravy of some type and that is what the goulash should provide. It can be too dry if you don't have something on hand and this is certainly going to beat bisto. 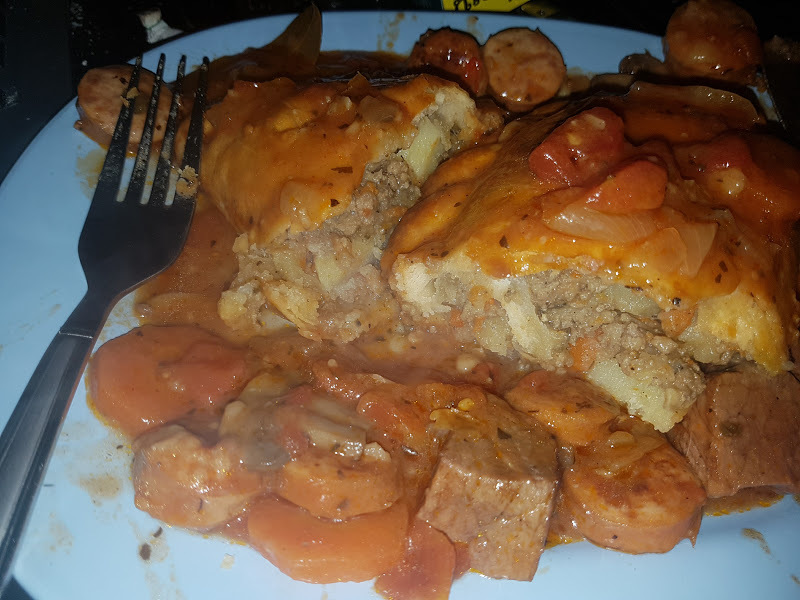 So this is a pasty with goulash drizzled over it. Eggs Benedict with smoked salmon and bacon on wholegrain toast, served with fries and a small sprout salad. At one of my favorite restaurants here in Chiang Rai. Okay normally this thread is for things we actually cook ourselves. That is also not a picture of any restaurant in CR. Correct it is not a photo of the restaurant but it is a photo of my breakfast taken with my iPhone here in Chiang Rai. Their salad is not bad either. Sorry I did not read the opening post so will refrain from further posts as they are against the rules. Looks nice, next time show us something you made. Nothing is against the rules but if you are going to show us staged shots of food you didn't make be prepared for criticism.